A pretty cool movie about a down and out screenwriter and the aging but naive star who takes him under her wing. This is an intriguing film about a down on his luck screenwriter, trying to escape town and the money he owes. The man runs into an abandoned mansion, only to find out that it’s not abandoned at all. There’s an elderly movie star who lives there, with naive aspirations to think she can still be an a list star and get back in the business. Her plan is to use this screenwriter to help her do so. somehow all of this is disguised to look like a film noir, complete with murder and voice-over narration, and parts of it work while other parts don’t. The decision to show the end of the movie at the film’s start, and give away any surprise, was a terrible one, but other than that, most things about this movie go over pretty well. 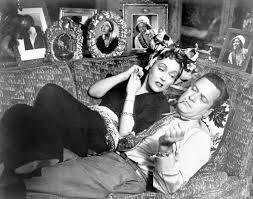 Sunset Boulevard is a movie about an aging actress that disguises itself as a film noir. It’s the strangest thing, how this movie uses murder as its bookends, to get the movie started by showing us a little bit about how it will all end, and trying to get our attention and make us wonder. It’s strange because it doesn’t really fit this movie, or gives the viewer the wrong idea of what the movie will be about. The opening with a main character’s voice over narration about the murder that will happen at the end of the film, is clearly meant to be like the opening of double indemnity. Made four years before this movie, double indemnity was a real noir through and through. Sunset Boulevard is something else. It’s the story of a screenwriter who is lost and finds an abandoned house. Or so he thinks. Before he ever gets anywhere near that house, we are following Joe Gillis, (played by William Holden), through the Hollywood industry as he takes meetings with executives and producers and can’t seem to get any breaks. Nobody likes his screenplay ideas, and Joe is just out of luck. to make matters worse, he can’t afford his rent and owes money. he drives out of town, hoping to hide out and find some kind of escape. All of this feels kind of familiar. It feels like the kind of movie where our main character did something terrible in the beginning, such as committed a murder, and is now running away, hoping to assume a new identity somewhere. The running away to a new world is a formulaic trope, taking on a fish out of water story, and here, it’s like a combination of the opening plots of detour and psycho. Only here, in Sunset Boulevard, our main character hasn’t really done anything horrible. He hasn’t just stolen a large sum of money or killed anyone. He’s just on the run trying to escape his life, where nothing seems to be working out. That’s when he comes to this old, mysterious house in the middle of nowhere. He likes the look of the situation, because there’s a big empty garage right at the entrance. it’s opened and just asking him to park his car in there. the main reason he was running away was because the people he owed money to wanted to take his car. now, with this garage, he can keep his car hidden away and completely out of sight. he wanders into the house and walks around the rooms trying to size up what kind of place it is and who it might have belonged to. his voice over narration compares it to the home of miss havasham in the dickens novel “great expectations,” and that’s exactly the kind of place it turns out to be with an older lady living there by herself (save for her butler.) this woman is norma desmond (played by gloria swanson), and when joe first finds her, she is in the process of burrying her dead pet monkey. it’s a strange meeting situation to say the least. norma and joe hit it off pretty quickly. it helps that she finds out he’s a screenwriter and that she is a forgotten movie star, trying to make it back into the industry. she convinces him that he can stay at her place, so long as he writes for her, and not realizing what he’s get himself into, he agress. he doesn’t really plan to stay there more than a night, but the butler goes to town, get’s joe’s things, and moves him in, all while joe is asleep. by the time he wakes up, it’s as if he has completely moved in and is now a permanent resident. from here the movie starts to slow down. joe writes for norma, but he also goes into town from time to time and starts to get deals going for himself outside of his elderly wealthy sponsor. joe hits it off with another woman, more his own age, who wants to be in business with him and help get his screenplays made. back at the mansion, there is some confusion about the relationship between joe and norma. she clearly thinks of him as a romantic interest. he has a hard time telling her that the feeling is not mutual. as we move into the second half of the film, things begin to pick up again. that’s because norma decides it is time for her to leave her mansion, venture out into the world, and take a day trip to the studio that once employed her. she goes to the paramount studios lot and tries to see director cecille b. demille on the set of one of his films. norma has been getting phonecalls from someone on a movie set and instead of returning the calls, she goes to visit the set in person, thinking they want her back. the movie set scenes are all fantastic. they’re actually the best scenes in the movie, with us learning the real reason why she was getting those phonecalls, and demille have to turn norma away as passively as he can. that brings us to the inevitable ending, which for some unexplained reason was telegraphed at the beginning of the film. when we see the characters in the same outfits and positions as the beginning of the movie, we know exactly what’s going to happen. if we didn’t, this would have been incredibly more interesting and thrilling. 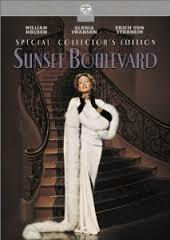 sunset boulevard is a good movie because it builds in momentum and gets more entertaining as it goes along. the initial premise is fine, but feels very familiar. then it takes a while for the movie to really get going, but luckily the wait is worth it. things really start to come together once the conflict builds up and all of these things that were bubbling up under the surface (norma avoiding the phonecalls, joe avoiding telling norma the truth about how he feels), finally come to light. the movie would have been far better without an opening that gave away the ending, but even still it is definitely an enjoyable film.